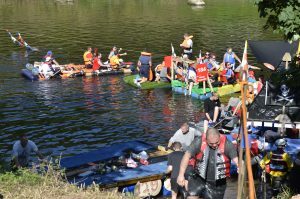 The annual Monmouth Raft Race, organised by the Rotary Monmouth, is in it’s 54th year and will be held on Sunday 1st September 2019. Once again, we are extremely pleased that money raised from this fantastic event will be benefitting St David’s Hospice Care and other great local causes. The Monmouth Raft Race is always a fun afternoon on the river with a great atmosphere, music, food and plenty of rafts! It’s a great day whether you are taking part or just there to watch the array of spectacular and creative vessels as they sail (or sink!) down the River Wye. A spectacle not to be missed! It starts at Noon at Monmouth Rowing Club (Just off the A40 at Monmouth) and is paddled over 6.5 miles down the beautiful River Wye to the finish at Tump Farm, Whitebrook, (courtesy of the Cullimore Family) where there is a Family Festival of entertainment and ample refreshment opportunities. After seeing off the rafts make your way to the finishing line (signposted) where the Family Festival takes place from 1pm until around 5pm. Why not ask your employer, or pub landlord, to enter a raft on your behalf? Constructing a raft and taking part is a great team building activity. Lots of fun for you, good publicity, and in support of a very worthwhile cause. Advice on how to build a raft is available on the official Monmouth Raft Race Website.